The life of John Frusciante may be available on film soon. The director August Elizabeth Thomas (from Los Angeles) is making a film about John Frusciante in its period of youth, during the Red Hot Chili Peppers, the attitude is concerned, the leaving of the band, the loss of River Phoenix and the dip in heroin. The movie probably was not authorized by John, then the names of the characters have different names. The film was in pre-production, in the final process of casting and filming locations in Hollywood and is slated for release until February 2011. John: man, around 20 years, long brown hair, slim, much like John Frusciante, guitar with skill, MAIN. Rio: man, around 20 years, blonde hair, like River Phoenix, an adjuvant. Tony: man, around 25 years, average height, long brown hair, tattoos, muscular, features Italian accomplice. Mike: Man, around 25 years, average height, slim, short blond hair, tattoos, an adjuvant. Chaz: man, around 25 years, tall, medium brown hair, an adjuvant. It is in fact a film based on his early life revolving around the years from 89 to 97. It is unauthorized but I have had conversations with John regarding it where he stated that he is not enthusiastic about a film about his life but he will not stand in the way, his only concern and exact words were -- "I don't want it to revolve around nothing but the drugs..." Which it doesn't. The main focal point is his relationship with the guitar and his passion for music. John also stated the he has no intention of reading the script but I have every right to do what I want with the film -- he won't stand in the way. He was very sweet about it, but I want to clarify that he provided no material. "Oh and filming won't start until Feb. Release is a ways off. " 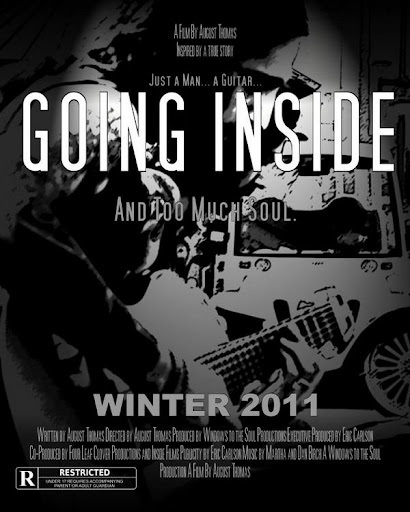 Hi, I'm the writer/producer/director of Going Inside revolving around the early life of John Frusciante and I would like to make a statement regarding the project. Oh and filming won't start until Feb. Release is a ways off. Is this true???!! Thank you for the info. Hopefully waiting for it. Yeah August Thomas told here as you can see. The writer of this project turned up on a River Phoenix forum around six months ago claiming she had written a really great script based on Phoenix's life. She claimed she had worked on it for over a year and had been a fan of his for over a decade. To proove her fandom she had linked two very off, windows-movie-maker 'trailers' for her project which were childish and dire to be honest. So fans requested to see her script. She linked it and we all had a read. The piece was a shallow and one dimentional in its representation of the characters and the dialogue consisted purely of quotes taken by said characters from old magazine articals. The writer clearly had no concept of the cultural times in which she has set her piece and no real knowledge of the real life character and experiences of the people she was attempting to write. One outstanding fact was that she had completey disregarded any musical elements from a biography based on a guy who lived and breathed music and had numerous close friends who did the same. She claimed this was 'not important' in the telling of Phoenix's story. Great. Previously, another script by another writer had been being linked around- this script contained a number of scenes depicting the relationship Phoenix shared with Frusciante. Which, by all accounts, was one of the defining relationships in his life. When questioned why she had not included Frusciante at all in hers, August proclaimed she did not think he was important enough to be included. What then insued was a debate between her and the Phoenix fans in which she displayed that she had ABSOLUTELY NO knowledge on John Frusciante whatsoever. Not his music. Not his past. Not his relationship with Phoenix and DEFINATELY in no way enough knowledge to be let loose with a screenplay less than a year later. The way she is punting this project left right and centre worries me. For starters, it doesnt help that i believe she is a lazy and poor writer (as demonstrated in her Phoenix project) but the main thing that bothers me is that she appears to have written this piece through her obsession with Phoenix and her want to write him for the screen. Since her Phoenix project was drawing no attention and she read some pretty compelling John and River scenes by the other writer she appears to now believe she is entitled to write John and throw Phoenix into the mix. Bluntly put; i believe she is using John to do a take on Phoenix. Amongst others deceased parties she appears to have an obsession with; she left a very nice letter addressed directly to Kurt Cobain on over 15 IMDB forums a few months ago for no apparent reason other than she is a bit deranged. As a Frusciante fan i find it appauling that this woman feels she is entitled to write him for the screen considering six months ago she had no interest either in him or his music. He was, as she put it, 'not important'. This is why her claim that it will be about 'the music' made me literally laugh out loud before i got seriously angry as hell. I dread how the dialogue is going to pan out. I strongly urge any fans to boycott this project. I hope John does read it and puts the breaks on it. Giuseppe Andrews would be a good match to play the role of John. He has a similar avant-garde music style and his album "Songs from "Look"" reminds one of some of Frusciante's early work. is this going to happend.. orrr..? Nah, at least this one not. This woman was obliged to keep away from John Frusciante (she was stalking him) by law. This is actually predominant system and thusly is fundamentally less tedious despite the fact that rendering great quality.